Decision Group’s Lawful Interception Suite (LI Suite) for Packet Data Network provides all the hardware and software needed for targeted network surveillance based on a court-issued warrant. The suite includes iMediator, iMonitor, our EDDM module that decodes and reconstructs network packets, and the evidence archiving manager – Data Retention Management System. These devices are integrated to create a powerful tool for the law enforcement community and their efforts to eliminate cybercrime. When deploying a Lawful Interception system, there are three important factors to consider: the devices, the telecom/ISP interception point, and the warrant that issued by a court and authorizing the legal interception of a suspect’s network traffic. When the warrant is issued by the court, the warrant information is entered into Decision Group’s iMonitor. The iMonitor then sends the warrant information as HI1 data to the iMediator device that is located within the telecom/ISP network. This target provision information is then sent to the ISP’s AAA and Broadband Remote Access Server (B-RAS). When the target accesses the internet through the telecom/ISP the AAA and B-RAS mirror the traffic and send the copy of the traffic to the iMediator by 2 types of data stream: X2 and X3. 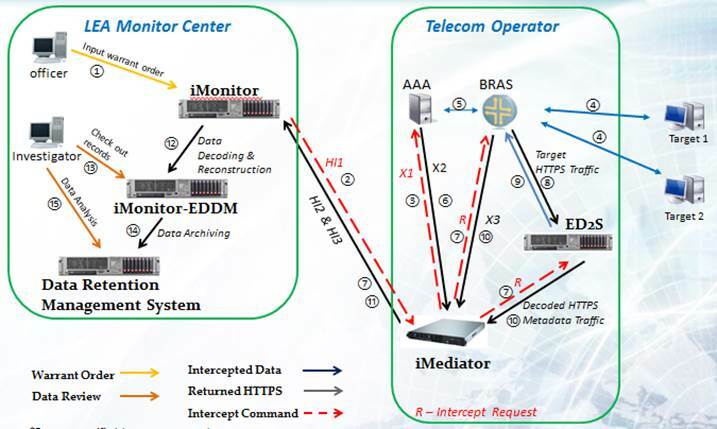 The X2 traffic that is sent to iMediator is the Interception Related Information, and the X3 traffic is the Content data. These two data sets are returned to the iMonitor in the law enforcement domain by the standardized form: HI2 and HI3 respectively, where the HI3 data is correlated with HI2 and sent to the EDDM module for decoding and reconstruction. After the data has been decoded, it will then be sent to the Data Retention Management System where analysis and/or archiving will take place (Figure 1). The main user interface for our Lawful Interception Suite is the iMonitor. Three user authorities exist for the iMonitor: Administrator, Operator, and Claimer. The Administrator has the authority to configure the system, create users, and enter warrant information. The Operator is restricted to only entering warrant information. The Claimer is the only authorized user to view the intercepted data. Figure 2 is a view of the iMonitor user interface in the Operator authority, the Operator can create and view warrant information, but does not have access to system settings, or intercepted data. Figure 3 displays the iMonitor user interface in the Claimer authority. Note that the Claimer authority can only view the intercepted data.